Original Editors -Jody Swimmer from Bellarmine University's Pathophysiology of Complex Patient Problems project. Osteosarcoma is also known as osteogenic sarcoma. 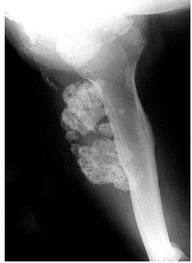 Osteosarcoma is a malignant primary cancer of long bones. Evidence of malignant osteoid bone and/or cartilage formation with destructive lesions and sclerosis is characteristic of the disease. Differentiating osteosarcoma from other tumors is defined by the production of an extensive and incompletely mineralized matrix that is seen with histological staining. The patient most often presents with pain prior to soft tissue swelling and an enlarging bone mass. This is due to the stretching of the periosteum which usually causes pain before the tumor is detected. Pain could also result from the weakening of the bone and the development of minute stress fractures. The pain may be present for several weeks to several months.The majority of patients with osteosarcoma present with localized pain at the primary tumor site. Range of motion may also be limited as the tumor encroaches upon the joint space. Although, these areas are most common, osteosarcoma can arise in any bone in the body. Systemic symptoms such as weight loss, pallor and fever are uncommon. The patient may be a tall adolescent, with males presenting more often than females. Patients with Rothmund-Thomson Syndrome (RTS) have an increased risk of developing osteosarcoma when compared with the general population. They also develop osteosarcoma at an earlier age. RTS is also called poikiloderma congenital, which is a rare autosomal recessive condition. This condition is characterized with skin issues such as atrophy, telangiectasias, pigmentation change, thinning or sparse hair, cataracts, small stature and skeletal anomalies. Among 220 children who were given Ra IV as therapy for tuberculosis, many developed osteosarcoma. • Immunostimulant: muramyl-tripeptide phosphatidyl-ethanolamine (MTP-PE) – macrophage inhibitor. Recent addition of liposomal MTP-PE in combination with adjuvant chemotherapy resulted in a statistically significant increase in overall survival versus standard combination chemotherapy. • T-cell responses by vaccination with the anti-idiotypic antibody mimicking CD55, a complement regulatory protein expressed by many solid tumors including osteosarcoma. The use of dendritic cell vaccines to enhance cytotoxic T-cell activation is being evaluated in xenograft models. • Small molecule therapy with inhibition of the Src kinase pathway involved in osteoclast activity. The orally available Src tyrosine kinase inhibitor AZD0530 is currently being investigated in a phase II clinical trial in osteosarcoma with pulmonary recurrence post-metastasectomy." + Codman’s Triangle – A triangular area of new subperiosteal bone that is created when a lesion raises the periosteum away from the bone. •MRI - Uses radio waves and strong magnets to create an image. No radiation is involved in this technique. MRI’s are often performed in order to better define a lesion that was previously identified via radiograph. MRI’s can typically determine whether a mass is a tumor, an infection, or bone damage from a different source. • Bone Biopsy (GOLD STANDARD) – This technique is an invasive procedure that involves surgically removing a piece of a suspected tumor. The removed piece of tumor is then examined, via lab testing, in order to ascertain its exact composition. • Chest CT – Scan used to detect pulmonary metastasis. CT scans are sometimes used to determine whether the tumor has metastasized into tissues adjacent to the lesion. • Nuclear Imaging - Used to aid in the initial staging/metastatic evaluation and response to therapy. • Positron Emission Tomography (PET) Scan – Utilizes a radioactive substance injected into the blood stream. The scan is used to obtain a general image of the entire body. 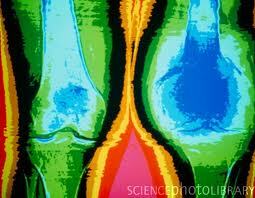 The imaging results can help detect the spread of osteosarcoma cells to other parts/systems of the body. • Blood Tests – Blood tests are not conclusive, but they may be helpful once a diagnosis is made to help determine the stage of cancer. High levels of alkaline phosphatase and lactate dehydrogenase (LDH) may suggest that the osteosarcoma is more advanced. The lungs are most often the first site of metastasis and are also the most common. The articular cartilage is thought to form a natural barrier to direct tumor extension. - Hemipelvectomy is often required for pelvic tumors. • If there is nearly complete tumor necrosis (about 99%) from preoperative chemotherapy, 5-yr survival rate is > 90%. Osteosarcoma should be treated at large medical centers where a multi-disciplinary team including physical therapists, occupational therapists, pediatricians, surgeons, psychologists and nursing staff will help manage the patient care. In an oncology setting, physical therapists manage the patient’s musculoskeletal, neuromuscular, integumentary and cardiopulmonary rehabilitation needs. Physical therapy interventions will consist of early postsurgical mobility training, strength and endurance restoration, pain control, and education and training of family members in helping patients with limited mobility. Physical therapists will help to correct balance and coordination impairments, make recommendations for home modifications that will enhance the patient’s independence, and educate and train the family members to assist and enable the patient to function independently. In addition, physical therapists will train the patient in stump management and training with the prostheses for those patients who undergo amputation. Rehabilitation following limb sparing procedures, rotationplasty or amputations focuses on retraining muscles, increasing strength and endurance, balance and range of motion as well as helping the patient return to school or work activities. It is of vital importance for the physical therapist to educate the patient and the adolescent's family in appropriate strength training protocols and precautions of overuse post discharge with a limb-sparing procedure. The patient will most likely have the long bones replaced with titanium rods and skin grafting procedures. It is also not uncommon to have a total knee replacement if the tumor is located near the distal femur and proximal tibia. These patients are frequently young adolescent males eager to return to full activities and may place their salvaged limbs at risk if they proceed too aggressively at discharge. The Functional Mobility Assessment (FMA) is a new tool for patients with lower extremity sarcoma. FMA requires the patient to perform functional mobility tasks. Outcome measures such as the L Test of Functional Mobility is the modified version of the Timed Up and Go test designed for people with lower-limb amputations. The Amputee Mobility Predictor is an instrument to assess the ambulatory potential of lower-limb amputees with and without the use of a prosthesis. Currently there is no evidence or high quality clinical study to support alternative management of osteosarcoma. Ayerza MA, Farfalli GL, Aponte-Tinao L, Muscolo DL. Does increased rate of limb-spraing surgery affect survival rate in osteosarcoma? Clinical Orthopaedics and Related Research. 2010; 468:11, 2854-9. Campanacci L, Manfrini M, Colangeli M, Ali N, Mercuri M. Long-term results in children with massive bone osteoarticular allografts of the knee for high-grade osteosarcoma. Journal of Pediatric Orthopedics. 2010; 30:8;919-27. Nagarajan R, Kamruzzaman A, Ness KK, Marchese VG, Sklar C, et al. Twenty years of follow-up of surviors of childhood osteosarcoma; A report from the childhood cancer survivor study. Cancer. 2011; 117:3, 625-34. Webber NP, Seidel M. The cutting edge. Combining advanced technologies: the Compress-Repiphysis prosthesis for pediatric limb salvage. Orthopedics. 2010;33(11)823-7. Wu P, Chen W, Lee O, Chen C, Huang C, Chen T. The prognosis for patients with osteosarcoma who have received prior manipulative therapy. J Bone Joint Surgery. 2010. 92:11, 1580-5. Paluska S. Persistent knee pain in a recreational runner. Department of Family Medicine. University of Washington, Seattle. 2002. Sahin H, ,Ceylan N, Bayraktarogulu S, Savas R. Cardiac metastasis of osteosarcoma: A case report.Central European Journal of Medicine. 2010; 5:551-555. Koob M, Durckel J, Dosh J, Entz-Werle N, Dietemann JL. Intercostal myositis misdiagnosed as osteosarcoma in a 10 year-old child.Pediatric Radiology. Springer-Verlag. 2010; 40:1, S34-S37. Karacalioglu O, Ilgan S, Kuzhan O, Emer O, Ozguven M. Disseminated metastatic disease of osteosarcoma of the femur in the abdomen: unusual metastatic patter on Tc-99N MDP bone scan. Annals of Nuclear Medicine. 2006; 20:6, 437-440. http://www.jsnm.org/files/paper/anm/ams206/ANM20-6-09.pdf. • The Gene Cluster Instability (GCI) Assay for Recombination. • A phase II window study of irinotecan (CPT-11) in high risk Ewing sarcoma: a Euro-E.W.I.N.G. study. • A mutation associated with centronuclear myopathy enhances the size and stability of dynamin 2 complexes in cells. 1. ↑ 1.0 1.1 1.2 1.3 1.4 1.5 Goodman C, Fuller K. Pathology: Implications for the Physical Therapist. 3rd ed. St. Louis: Saunders Elsevier; 2009. 2. ↑ Benayahu D, Shur I, Marom R, Meller I, Issakov J. Cellular and molecular properties associated with osteosarcoma cells. Journal of Cellular Biochemistry. 2002; 84:108-114. 3. ↑ 3.0 3.1 3.2 3.3 3.4 Osteosarcoma/Malignant Fibrous Histiocytoma of Bone. National Cancer Institute. www.cancer.gov. Accessed February 18, 2011. 4. ↑ 4.0 4.1 4.2 Federman N, Bernthal N, Eilber F, Tap W. The multidisciplinary management of osteosarcoma. Current Treatment Options in Oncology. 2009; 10:82-93. 5. ↑ Kansara M, Thomas D. Molecular Pathogenesis of Osteosarcoma. DNA and Cell Biology. 2007; 26:1; 1-18. 6. ↑ Unni K. Osteosarcoma of the bone. J Orthop Sci. The Japanese Orthopaedic Association. 1998; 3:287-294. 7. ↑ Miller R. Contrasting Epidemiology of Childhood Osteosarcoma, Ewing’s Tumor, and Rhabdomyosarcoma. National Cancer Institute. 1981; 56; 9-15. 8. ↑ Siegel H, Pressey J. Current concepts on the surgical and medical management of osteosarcoma. Expert Rev. Anticancer Ther. 2008; 8:8; 1257-1269. 10. ↑ 10.0 10.1 10.2 Aboulafia A, Malawer M. Surgical management of pelvic and extremity osteosarcoma. Cancer Supplement. 1993; 71:10; 3358-3366. 11. ↑ 11.0 11.1 11.2 11.3 11.4 11.5 11.6 www.cancer.org/Cancer/Osteosarcoma/DetailedGuide/osteosarcoma-diagnosis accessed March 11, 2011. 12. ↑ Punzalan M, Hyden G. The role of physical therapy and occupational therapy in the rehabilitation of pediatric and adolescent patients with osteosarcoma. Anderson Cancer Center. Houston, TX. 2009. 13. ↑ Deathe A, Miller W. The L test of functional mobility: Measurement properties of a modified version of the timed "up and go" test designed for people with lower-limb amputations. 14. ↑ Gailey R, Roach K, Applegate B, Cho B, Cunniffe B, et. al. The amputee mobility predictor: An instrument to assess determinants of the lower-limb amputee's ability to ambulate. Arch Phys Med Rehabil. 2002;83: 613-625. 15. American Cancer Society. 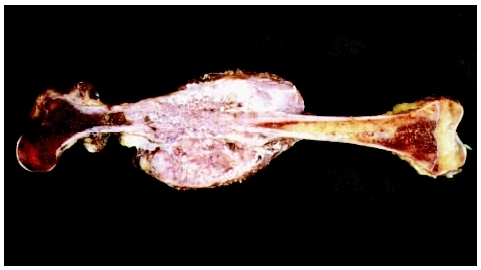 Osteosarcoma. Http://www.cancer.org/acs/groups/cid/documents/webcontent/003129-pdf.pdf (accessed 7 March 2014). ↑ Aboulafia A, Malawer M. Surgical management of pelvic and extremity osteosarcoma. Cancer Supplement. 1993; 71:10; 3358-3366.